What just happened in Catalonia? asked Lola García in the Barcelona daily La Vanguardia (Spain). All eyes were on Catalan leader Carles Puigdemont after the region’s independence referendum earlier this month, in which more than 90 percent of votes were cast in favor of seceding from Spain but a boycott by pro-Spanish voters left turnout at a lowly 43 percent. Would Puigdemont declare independence and precipitate a constitutional crisis, or call for mediation and disappoint his nationalist followers? 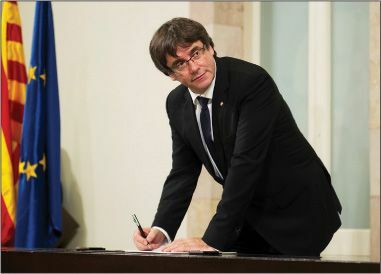 In the end, he tried to do both, “in a twisted, convoluted statement that pleased nobody.” Puigdemont declared this week that the results of the referendum mandated that autonomous Catalonia become an independent state. But in the next breath he asked the Catalan Parliament “to suspend the effects of the declaration of independence so that, over the next few weeks, we might undertake a dialogue” with Madrid. Some wag on Wikipedia promptly listed Catalonia as the shortest-lived sovereign state, with a duration of eight seconds.